Innovative Roofing co-owners Patrick McNichols (left) and Brian Benson. Incorporating new products and skills—without sacrificing customer service—is a combination for success for St. Louis roofing coNtactor co-owned by friends and brothers-in-law. 2016 ended on a high note for Innovative Construction & Roofing. In December, the roofing contractor was honored as a Small Business Success Story by Manta. 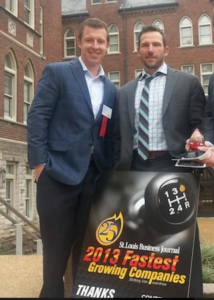 As a premier St. Louis roofing company, co-owners Patrick McNichols and Brian Benson attribute their success to a combination of key factors. Topping the list is providing legendary customer service to their clients. “Customer service is the most important thing, even if it comes to losing money to keep a relationship,” says Benson. In addition, a smart growth strategy and continually honing their skills has added to the company’s continued success. Rounding out the equation is a crew of experienced roofing professionals. These pros pride themselves on getting the job done right the first time. As a result, the St. Louis roofing contractor is able to provide their customers with a Lifetime Workmanship Guarantee.